Farm Street Church this week witnessed a joyful start to the Advent season as it hosted the Jesuit Refugee Service's Advent service. The readings, which included both traditional scripture and poetry, read by JRS staff, volunteers and refugees, gave the packed church plenty to reflect upon. The service was led by Fr Damian Howard SJ, who asked in his welcome that we "think of those who are far from home, missing their loved ones, and make ourselves present to them as God makes himself present to us." His homily identified the wisdom of refugees, who uniquely have the experience to understand what is needed to bring reconciliation in the "complexity and grime of the human world". He concluded "may you welcome the God of refugee wisdom into your home this Christmas, may you sense His presence anew, inviting you into saving companionship." Read the full homily. 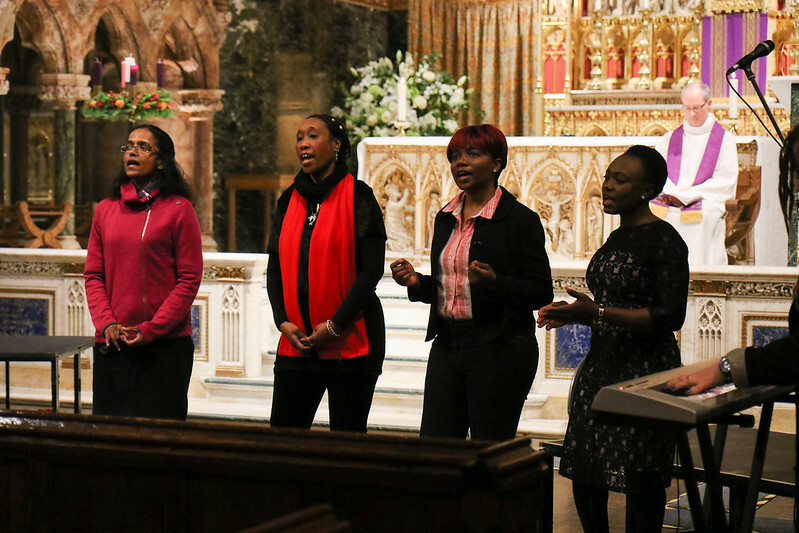 Highlights of the service were performances by the JRS Gospel Choir, supported by Magdalena Supel of the Soul Sanctuary Gospel Choir, and the JRS UK Refugee drama group, supported by Rise Theatre. Rise Theatre explained, "we have been working with the drama group for nine weeks. Early on someone talked about being like migrant geese, which got us thinking of the story of the Christmas Goose. The story tells of a husband and wife: the wife knows and loves Jesus; the husband cannot understand how a God could come to earth as a man. Through trying to save a flock of migrant geese on a stormy night, the husband has a revelation." As the migrant geese, the actors gave witness to their experience of trying to seek sanctuary: "The system is designed to create chaos, to kick you when you are down." Sarah Teather, JRS UK Director, thanked those involved in preparing the service, and reminded everyone that the work of accompaniment fulfilled through JRS's weekly day centre, its day centre plus activities (including the choir and drama group), and the detention visiting programme are all reliant on the support of people of good will. Please support the JRS Advent Appeal to help us provide saving companionship to Han and all our refugee friends.